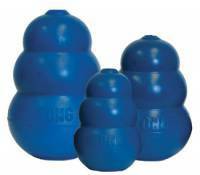 Lab Supply is proud to provide a huge selection of enrichment devices for primates, including Kong Toys. We offer a special type of Kong Toy for primates that now comes with a chain so that it can be hung from a cage. This black Kong Toy is attached to a welded link with a stainless steel chain and twist clip. This toy can be filled with treats of your choice and then can be used to promote mental and physical activity for your primates. This product is cage washer safe for your convenience. If you are interested in theses great extra large Kong Toys attached to chains, then please click here to view this product in our online store. Here at Lab Supply, we are committed to making sure that you find exactly what you are looking for. If you have any questions about the Kong Toys that we offer in our store, then please click here to visit our contact page. We will be more than happy to answer any questions that you may have.